We don't 100 percent understand them, but we definitely respect them. Jennifer Lopez just found a creative way to wear denim during the hot summer months. The singer and actress recently stepped out in slouchy denim boots from Versace’s Resort 2019 collection. But they're not just made of denim: Each boot is its own jeans leg, complete with a back pocket and a belt. It’s unclear whether the pockets actually hold anything, but the belts are a stroke of genius for anyone who has ever struggled to keep slouchy boots from sliding down the leg. J.Lo paired the boots (or are they deconstructed pants?) with a crisp, white oversized shirt dress, a black bag and futuristic shades. It was kind of like her own unique take on the popular "lampshading" trend. The “World of Dance” judge — who recently celebrated her 49th birthday with an age-defying bikini pic — also sported a gold necklace spelling out “Jennifer” in all caps, in case you forgot who the boss is. Reactions to the boots were passionate on social media, with some people questioning the unusual shoes but others calling J.Lo a style genius. JLo knows how to wear them. 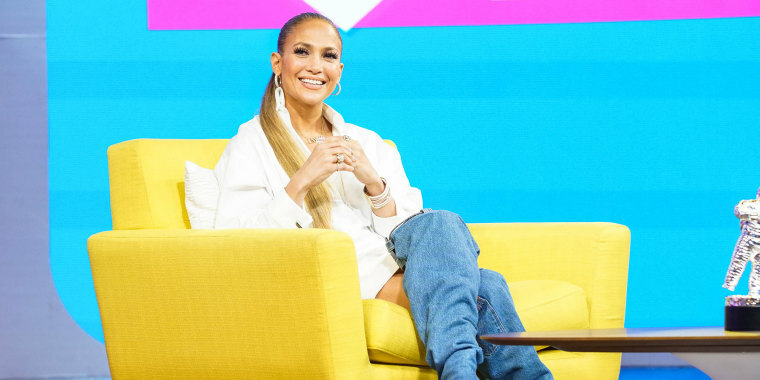 Lopez has definitely always been a trendsetter, not a follower, so who knows — maybe denim boots will be popping up everywhere this fall!